← Random Panel: "It's a bar of soap!" HM3: The day is saved! 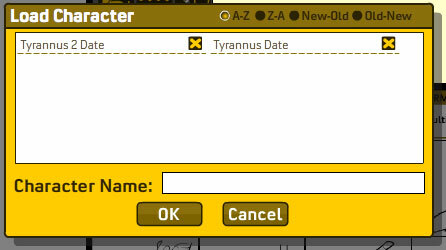 The HeroMachine 3 Alpha now allows you to Save and Load your characters! Currently characters are stored on your local hard drive only, although in the future you will have the option to "export" or "import" some sort of text string like in HeroMachine 2.x as well. This is all-new stuff, something I haven't ever done before, so please let me know when and how it breaks on you. The four radio buttons at the top of the box allow you to sort your saved characters in alpha order normal, alpha order reversed, date order from newest to oldest, and date order from oldest to newest. When you get more than 12 characters, a scroll bar appears allowing you to scroll up and down. Currently there's no check in place preventing you from scrolling all the label boxes completely off the screen, but if you close and reopen the save/load dialog box, they'll be back in place. I don't yet have warnings in place for when you delete a character, so be careful. I also don't yet have a notification in place telling you the character was successfully saved, but it will show up if you re-open the save or load box. You can't currently overwrite a character with an updated version. You can either name it "[Name] 2" or the same name, then sort it by creation date, and delete the older one. Eventually I'll have a "quick save" and/or an "overwrite" option that will let you quickly save over the top of what you're already doing, but that was going to take too long. As an added bonus, "Clear All" should now work properly when trying to delete a character with multiple instances of the same item. Hope you enjoy it! Again, be sure to let me know if/when/how this breaks on you. 44 Responses to HM3: The day is saved! I will happily be first to say “Thank you.” Once I get to my ‘real’ computer I’ll dive in and give it a workout. I’m excited to see what we can do with more time to plan and tweak our designs. Jeff, I have found a serious problem. When I loaded a saved character of mine and tried to add more belt items, all the belt items except for the first I laid down disappeared. The belt items would not work after that. When I tried loading my character again, the tops military, and the footwear disappeared as well. When I exited the program and reloaded my character everything was fine until I tried the belt slot. So you had multiple belt items in the saved character already, right? Did any other slots have multiple items? Way to go on the save/load features! I was just wondering what was next on your agenda for HM3. This will give me a chance to attack some ideas which would take a few sessions to complete. Otherwise, I’d need use VMWare and suspend the VM multiple times. Anybody else have a problem where HM3 just doesn’t work at all? Unless I’m doing something wrong. There’s a box with colors on top of the other colors (if that makes sense) and I can’t click on anything. Using Firefox on a Mac. Help! OK now that I wrote that it’s working, of course. This happened before though, so any ideas would be helpful. It doesn’t seem to be a problem anymore. Maybe it was because next time I clicked on a belt item instead of selecting items from the menu. Just something to remember, when you load your character all the slots are set to single instead of multiple. Jeff, where does it save the file? (I computer hop a lot, and would like to move it with me) Will you set it up later so we can browse for the file/location? I’m having a little trouble with the save/load feature. Gene, not to but in, but in response to what you asked, it states “Currently characters are stored on your local hard drive only”. I take it that means only one computer for now. Thanks Martian, I caught that, I was wondering where on the hard drive. I’m assuming there is a file stored someplace. Way to go, Jeff! Even w/the bugs, the ave/load feature is a huge element. Good job! Wow! This is great! The save system is like a Hero Archive Waiting list for me! Great Job! I’m up for the next step. I think it’s time for the ladies to step into the spotlight! When I tried to load my character the layers were messed up, patterns were missing, and all the items from entire item slots were missing. Also many of the items from the item slots that had not disappeared, were gone while other items from the same item slot were still there for no apparent reason. I think I’m going to have to wait to save my characters until after the bugs have been worked out. Most of my work was gone. LoneWolf, I have to wonder if there’s not something awry with your settings or your browser … Is anyone else seeing those kinds of problems? I have noticed that the layering isn’t all that great, I do need to work on that. Gene, the files are Flash cookies, they’re not readily accessible outside of the run-time environment. Even if you were to copy them you couldn’t (as far as I know) read them on another system, they have to be played by the same movie in the same browser. I think. It’s all a bit new to me, but in the little bit of research I did on this it seems as if the files are not really something you can get to, which is by design as a security feature of the Flash authoring environment. You guys tell me, what do you want me working on next? I can’t do the female stuff til the other illustrator gets me the template, so that’s out, but otherwise anything goes. I’ll spend the next day or two fixing bugs — making hand patterns work, making the patterns fill the entire default screen area, etc. After that, it’s your call. The most likely candidate is to move on to converting more 2.x sets of items, like all the hand-held stuff, more coats, etc. etc. etc. my vote is to convert all the rest of the hand held stuff, etc. Not sure if/how that was on the list. Patterning and multiple items does some of the work, but others cannot be matched — crystal, rivets, spots, etc. Female is interesting, but really feel it should be done after all male items are resolved. Otherwise, could “paint yourself into a corner” on an unexpected point(s). I want to see the ladies step in the spotlight. I hate to be the voice of complaining, but the flash adds of punch-out are causing a seriously annoying glitch to occure. First the mouse cursor begins to flash in and out and then parts (from random selections, I don’t see any pattern to it) become stuck permanently unless I refresh the entire page. The stuck parts are unmovable, yet they can be recolored. I suspect this isn’t entirely related to the flash adds, but my memory isn’t what it used to be. In any case, I thought I should bring it to someone’s attention. I vote for hand-held items. Also, where are the hand energy effects going to go? Are you going to slot that in hand-held items? RitoruBushi: I’m having the same problem. I also think that adding in hand energy items would be a welcomed addition. However, there’s one empty slot left in the primary catagory lists. Why not add in the hand energy items there? And for that matter, why stop with the hands? The possibilities of adding in energy-based items/effects could be used to go all over the entire body, and in localized areas. The head, the face, eyes, finger tips, bicepts… the possibilities are almost limitless. But that is just a suggestion. I vote for Conversion of 2.x Items. 🙂 More toys please! Jeff, if the files are flash cookies, does it means they will disappear if I delete my cookies (via my WebBrowser)? OH, and for itemto add, I will quote Lawrence Boddiker from Robocop: Guns,Guns,Guns! Geek nitpick: It’s Clarence Boddiker. I tried loading my character in Firefox instead of Internet Explorer and I got the same result. As for problems with my settings, I don’t know what they would be. I don’t know either LoneWolf, this is all pretty new to me. I am at a loss until I hear from others maybe having the same problem, and I can figure out some commonalities. It’s all working pretty much as expected elsewhere as far as I can tell. I’m sort of flying blind here. @Imp: Energy effects will be in an “Aura” set for most slots, particularly Body stuff. I’ll report the problem with the boxing ad, several of the Flash-intensive ones are hurting things and UGO has been pretty good overall about removing those. Unless it was because I saved in Internet Explorer. By the way, I suspect that the save file is actually saved to your computer in the temporary internet files. Which means it could be problematic if you clear your computers temporary internet files. I was hoping for the code you can save in notepad or word. its a good job but not good if you use multiple computers. Tristan, as I said, that’s coming later. For now you can follow the path in my last comment and move the .sol files around, it’s the same thing essentially. I think. Also, remember this IS an ALPHA. You guys are seeing it being built as it happens, in real time, warts and all. Which is pretty cool. Usually you’re just given a finished product and that’s it, but you’re basically building it right along with me. Of course that involves some growing pains, but hey, that’s what makes it fun, right? Jeff – thanks for the heads-up on the Aura/energy info. The Flash binary data *SharedObject* does transport between computers — moved one file between three computers successfully. (Am using Firefox & WinXP here, so do no know if works with IE6, IE7, IE8, Opera, Safari, etc.) For the ADVENTUROUS feel free to Google its location, use, etc. After copying the file from one computer to another it may be necessary to reload the HM3 Alpha web page, and/or restart the browser. Would anticipate issues between version of Flash Player(s), operating systems, browsers, etc. Being in a _Macromedia_ labelled folder is odd, as Adobe has owned that company for a few years now — a detail they have yet to resolve, and may change “at any time”. Sorry to be “that guy” yet again, but I think I found a small pattern. However, I wouldn’t bet the farm on it. I don’t think it’s -just- the boxing flash ad. I suspect it’s any flash ad that allows for mouse interaction. I hit the same “glitch” with the Nintendo DSi add. I also remember hitting this glitch with the Wolverine ads as well (the razor add and the game add). I am also experiencing some frustration when i load, the layers are messed up, i suspect the program puts the layers where it thinks they go instead of saving exact layer location info,also i reorder the layers the way i want them but as soon as i switch to a new category, the layers all revert to the wrong places they were when loaded, also the category boxes show new category, however the thumbnail window shows the backplane preview thumbs, this happens with both firefox and IE. this is frustrating as now i cant finis my saved character, if this is caused by browser settings, anyone know what settings would need changing? Regarding next items, looking through the list and building characters up I have noticed both elbows and knee’s are always uncovered (no items for them yet). any chance on working on items for those areas as they seem to be the only parts of the body we can’t equip yet (without using other items and rescaling of course). Just me 2 penny worth of course. Finally, I get to save my HM3 Characters! YAY! Will there be a Desktop version of Heromachine 3 on the way? @Brandon: No discussion has been held yet over a Desktop Edition of HM3 with UGO. There’s no reason currently why that can’t be done — none of the components are dependent on being online — but I don’t know for sure what their position on it will be. I have a suggestion for you regarding a really bad superhero costume: the black/white striped horror of a suit the guy on the left is wearing.